Wildfly 12 - Problem invoking subsequent (A->B->C) remote EJBs (server-to-server) in the same transaction. With a new transaction works. I have a web application (App-1) which invoke two (App-2 and App-3) remote EJBs (each one in its own server) in the same transaction. Important notice: App-1 is in the same server as App-2. But App-3 is in another server. Only the first remote invocation works (App-1 -> App-2), the second one (App-2 -> App-3), Wildfly tries to lookup at the same server, instead of lookup in the other server. <remote-ejb-receiver> is properly declared, socket-binds as well. And works fine, but just for the first remote invocation in the stack. App-1 has a timer-service that start a transaction, do some work and invoke an EJB in App-2 (remote EJB to the same server). Then, App-2 invoke an EJB in App-3 (remote EJB call to another server). This works fine in the first remote invocation. App-1 can lookup and invoke App-2, which is on the same server. At the second invocation, when App-2 tries to lookup and invoke App-3 in the same transaction (that one created in the App-1 timer-service), Wildfly can't find App-3's EJB throwing a NoSuchEJBException. Looks like the App-2 is trying to lookup App-3 in the same server as App-2 and can't find it. ===> But if a new transaction is created (with REQUIRES_NEW) between App-1 and App-2, Wildfly is able to find App-3 and the invocation works! App-2 has a REST endpoint and receives a GET request, open a transaction, do some work and invokes App-3 (other server). This call works fine, Wildfly lookups the remote EJB in the other server, get the result of App-3 (back execution to the first server) and invoke App-1 (same server). First call works fine. Wildfly correctly find the App-3 in the other server and make the invocation. Then, back to the App-2, tries to invoke App-1 (same server) but it can't. Throwing a NoSuchEJBException because it tried to lookup App-1's EJB int the App-3's server. ===> But, again, if a new transaction is created (with REQUIRES_NEW) between App-2 and App-1, Wildfly is able to find App-1 and the invocation works! Looks like Wildfly's EJB Client is "reusing" the target server when is within the same transaction. 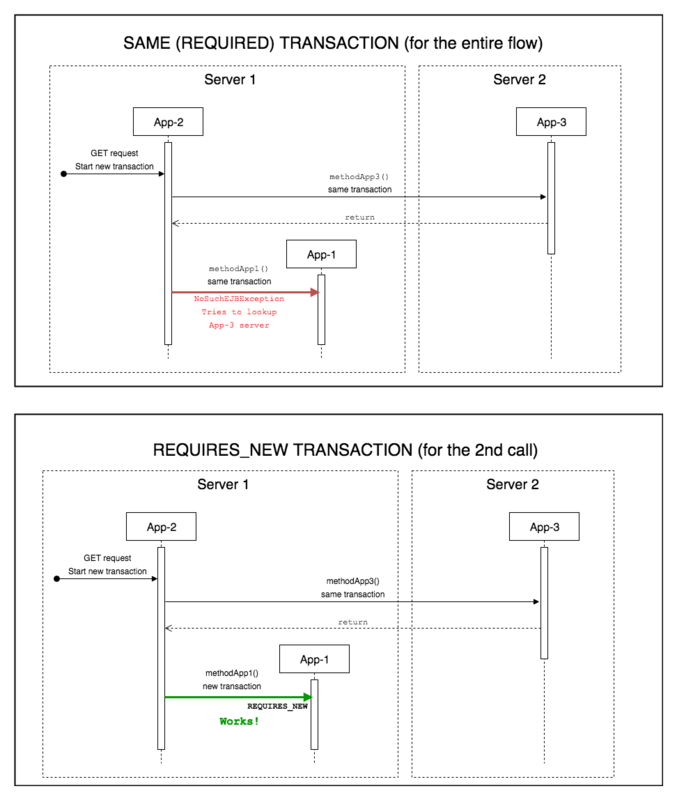 But when a new transaction is created, it can properly finds the correct server. 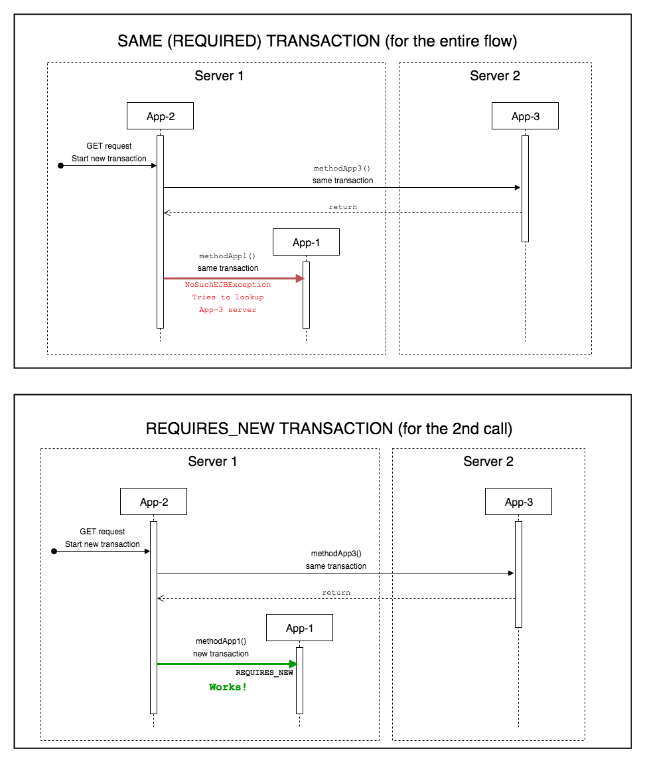 How can I properly configure the server or the apps to not "reuse" the target server for the sequent calls? 1. Re: Wildfly 12 - Problem invoking subsequent (A->B->C) remote EJBs (server-to-server) in the same transaction. With a new transaction works. 2. Re: Wildfly 12 - Problem invoking subsequent (A->B->C) remote EJBs (server-to-server) in the same transaction. With a new transaction works. Thank you for your response, andey ! Our apps already use distributed transaction through JTA and works fine. 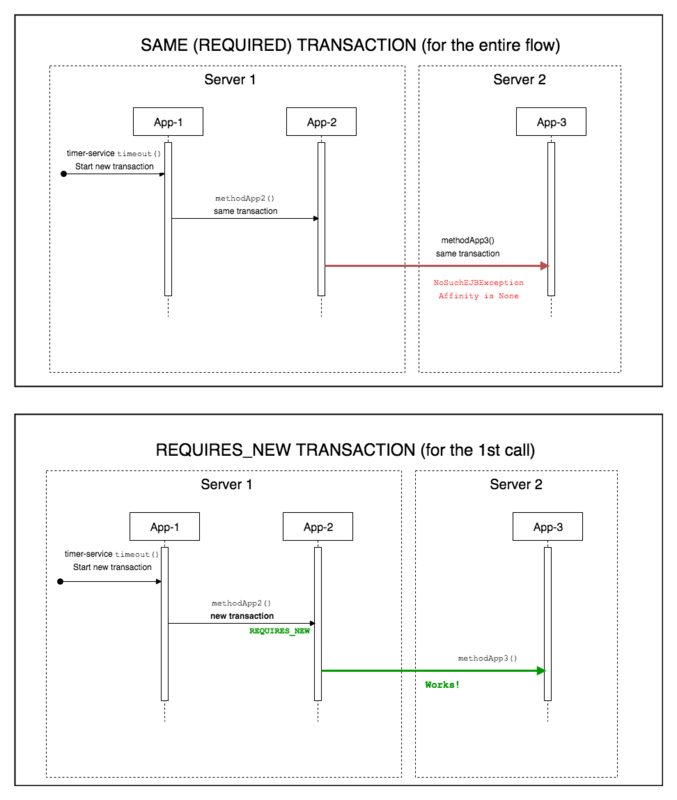 The problem we are facing now is to perform two remote EJB invocations targeting different servers in the same distributed transaction. Once the app performs the first remote ejb call, it seems it is "caching" this target server and at the second ejb call to other server, Wildfly tries to lookup this second ejb but targeting at the first server, which is wrong. It should targeting at the second server as declared in remote-ejb-receiver. 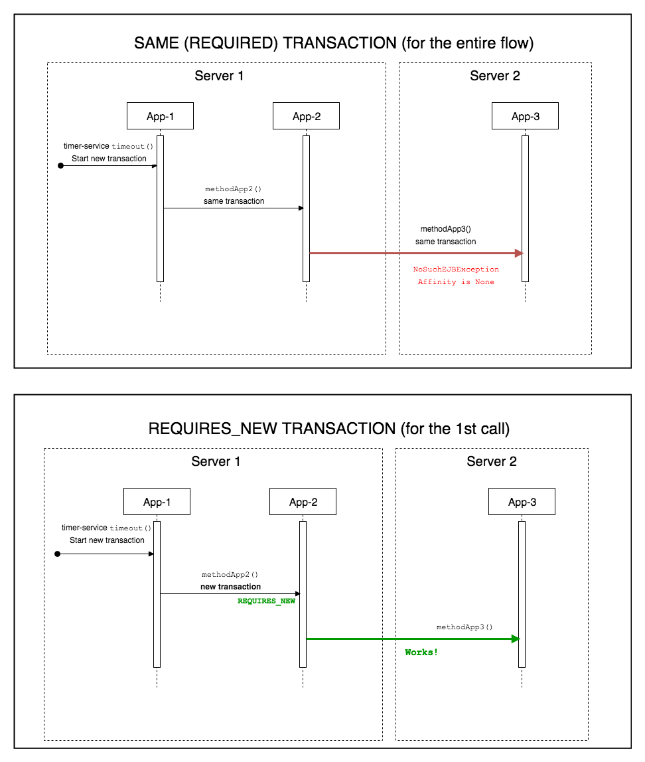 But, if I change the code in order to create a new transaction before the second call, Wildfly correctly targeting the second server. The problem is that I can't change all the remote invocations to REQUIRES_NEW because I don't want to lose the atomicity of the whole transaction. 3. Re: Wildfly 12 - Problem invoking subsequent (A->B->C) remote EJBs (server-to-server) in the same transaction. With a new transaction works.